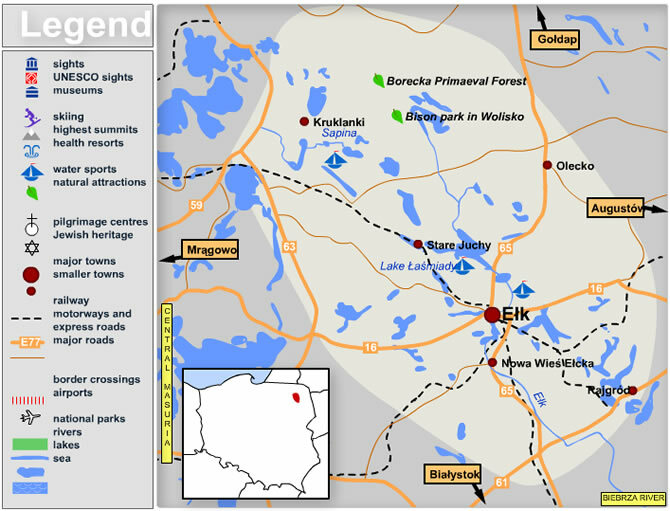 The Elk Lakeland is a separate part of the eastern Masuria Lakeland, the most popular region among people who dream about holidays close to the water and away from the crowds of sailors who usually choose central Masuria. In comparison to the Great Masurian Lakes, this region is more remote and calm. Though the lakes of the Elk area are smaller, there are many of them and they combine good recreational conditions (angling, picking mushrooms, cycling, and canoeing) with typical country charm. North of Elk, towards the Polish-Russian border, is the Borecka Forest, which forms the northern part of the Elk Lakeland. This wild wood has many postglacial hills and peat lands, with several natural reserves, is home to many animals including the European bison, making the area an interesting destination for hikers and lovers of nature.